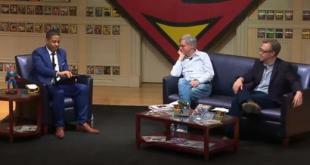 DC legends Paul Levitz and Dan Jurgens discussed Superman's legacy and future, from those iconic red trunks to the superhero's new life as a family man, during a Q&A in Washington, D.C. If future episodes can keep up this pace and round out the supporting characters, CBS has a real hit on its schedule. "There are no hidden messages in the book, just a lot of action, suspense, and humor." Research shows that expressing gratitude and praising others also benefits the giver. Case in point: my daughter's letter to "Superman." The people behind the desks, those with ink covered hands and color stained fingers, they were the real superheroes. Coverage of comic book panels on Day Two of San Diego Comic-Con. The remakes, revivals, and re-imaginings will go on ad infinitum because, unfortunately, all things on heaven and earth that can be imagined can be re-imagined. My top ten events of Thursday's programming. The drama at the beginning is compelling, by the end there’s just too damn much going on, and it becomes truly mind-numbing.